For the first time the problems of voice services self-similarity are discussed systematically and in detail with specific examples and illustrations. Self-Similar Processes in Telecommunications considers the self-similar (fractal and multifractal) models of telecommunication traffic and efficiency based on the assumption that its traffic has fractal or multifractal properties (is self-similar). The theoretical aspects of the most well-known traffic models demonstrating self-similar properties are discussed in detail and the comparative analysis of the different models’ efficiency for self-similar traffic is presented. 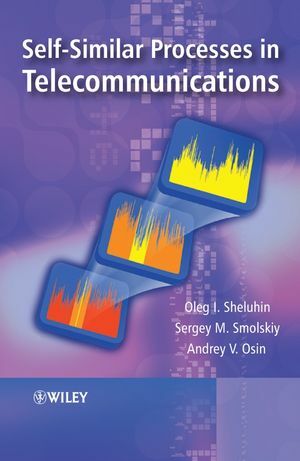 This book demonstrates how to use self-similar processes for designing new telecommunications systems and optimizing existing networks so as to achieve maximum efficiency and serviceability. The approach is rooted in theory, describing the algorithms (the logical arithmetical or computational procedures that define how a task is performed) for modeling these self-similar processes. However, the language and ideas are essentially accessible for those who have a general knowledge of the subject area and the advice is highly practical: all models, problems and solutions are illustrated throughout using numerous real-world examples. The book will appeal to the wide range of specialists dealing with the design and exploitation of telecommunication systems. It will be useful for the post-graduate students, lecturers and researchers connected with communication networks disciplines. Oleg I. Sheluhin is Head of Department of the Radio Engineering and Systems department of Moscow State Technical University of Service (MSTUS). He specializes in the areas of statistical radio engineering, radio systems theory and information systems simulation. Sergey M. Smolskiy is Head of the Department of Radio Receivers in the Moscow Power Engineering Institute (MPEI). He has extensive experience in the field of telecommunications and is an active member of IEEE. His recent research topics include low distance radar systems and radio measuring systems. Andrey V. Osin is currently Assistant Professor in the Department of Radio Engineering and Radio Systems at MSTUC. His PhD thesis focused on imitation modeling of self-similar processes in telecommunications and he has since published widely on the subject in numerous articles and conference journals. 1 Principal Concepts of Fractal Theory and Self-Similar Processes. 1.1.1 Fractal Dimension of a Set. 1.1.3 Fractal Dimension D0 and Informational Dimension D1. 1.2.1 Definitions and Properties of Self-Similar Processes. 1.2.3 Long-Range and Short-Range Dependence. 1.3.1 Distribution with ‘Heavy Tails’ (DHT). 1.4.1 Time Domain Methods of Hurst Exponent Estimation. 1.4.2 Frequency Domain Methods of Hurst Exponent. 1.5 Hurst Exponent Estimation Problems. 1.6 Self-Similarity Origins in Telecommunication Traffic. 1.6.2 Data Generation Data Structure and Its Search. 1.6.4 Means of Network Control. 1.6.5 Control Mechanisms based on Feedback. 2 Simulation Methods for Fractal Processes. 2.1.1 RMD Algorithm for FBM Generation. 2.1.2 SRA Algorithm for FBM Generation. 2.2.1 FFT Algorithm for FGN Synthesis. 2.2.2 Advantages and Shortcomings of FBM/FGN Models. 2.3 Regression Models of Traffic. 2.3.1 Linear Autoregressive (AR) Processes. 2.3.2 Processes of Moving Average (MA). 2.3.3 Autoregressive Models of Moving Average, ARMAðp; qÞ. 2.3.4 Fractional Autoregressive Integrated Moving Average. 2.4.1 Statistical Characteristics of the Point Process. 2.4.2 Fractal Structure of FPP. 2.4.3 Methods of FPP Formation. 2.5 Fractional Levy Motion and its Application to Network. 2.5.1 Fractional Levy Motion and Its Properties. 2.5.2 Algorithm of Fractional Levy Motion Modelling. 2.5.3 Fractal Traffic Formation Based on FLM. 2.6 Models of Multifractal Network Traffic. 2.6.2 Modified Estimation Method of Multifractal Functions. 2.6.3 Generation of Traffic the Multifractal Model. 2.7 LRD Traffic Modelling with the Help of Wavelets. 2.8.1 M/G/1Model and Pareto Distribution. 2.8.2 M/G/1Model and Log-Normal Distribution. 3 Self-Similarity of Real Time Traffic. 3.1 Self-Similarity of Real Time Traffic Preliminaries. 3.2 Statistical Characteristics of Telecommunication Real Time Traffic. 3.2.2 Pattern of TN Traffic. 3.3.1 Voice Traffic Characteristics at the Call Layer. 3.3.2 Voice Traffic Characteristics at the Packet Layer. 3.4 Multifractal Analysis of Voice Traffic. 3.4.2 Algorithm for the Partition Function SmðqÞ Calculation. 3.4.3 Multifractal Properties of Multiplexed Voice Traffic. 3.4.4 Multifractal Properties of Two-Component Voice Traffic. 3.5 Mathematical Models of VoIP Traffic. 3.5.2 Voice Traffic Models at the Call Layer. 3.5.3 Estimation of Semi-Markovian Model Parameters and the Modelling. Results of the Voice Traffic at the Call Layer. 3.5.4 Mathematical Models of Voice Traffic at the Packets Layer. 3.6 Simulation of the Voice Traffic. 3.6.2 Parameters Choice of Pareto Distributions for Voice. 3.6.3 Results of Separate Sources Modelling. 3.6.4 Results of Traffic Multiplexing for the Separate. 3.7 Long-Range Dependence for the VBR-Video. 3.7.1 Distinguished Characteristics of Video Traffic. 3.7.5 Nonstationarity of VBR Video Traffic. 3.8 Self-Similarity Analysis of Video Traffic. 3.8.1 Video Broadcasting Wavelet Analysis. 3.9 Models and Modelling of Video Sequences. 3.9.1 Nonstationarity Types for VBR Video Traffic. 3.9.2 Model of the Video Traffic Scene Changing Based on the. 3.9.3 Video Traffic Models in the Limits of the Separate Scene. 3.9.4 Fractal Autoregressive Models of p-Order. 3.9.5 MPEG Data Modelling Using I, P and B Frames Statistics. 3.9.6 ON/OFF Model of the Video Sequences. 3.9.8 Hurst Exponent Dependence on N.
4 Self-Similarity of Telecommunication Networks Traffic. 4.2 Self-Similarity and ‘Heavy Tails’ in Lan Traffic. 4.2.1 Experimental Investigations of Ethernet Traffic Self-Similar. 4.2.2 Estimation of Testing Results. 4.3 Self-Similarity of WAN Traffic. 4.3.1 WAN Traffic at the Application Level. 4.3.2 Some Limiting Results for Aggregated WAN Traffic. 4.3.3 The Statistical Analysis of WAN Traffic at the. 4.3.4 Multifractal Analysis of WAN Traffic. 4.4 Self-Similarity of Internet Traffic. 4.4.1 Results of Experimental Studies. 4.4.2 Stationarity Analysis of IP Traffic. 4.4.3 Nonstationarity of Internet Traffic. 4.5 Multilevel ON/OFF Model of Internet Traffic. 4.5.2 Estimation of Parameters and Model Parameterization. 4.5.3 Parallel Buffer Structure for Active Queue Control. 5 Queuing and Performance Evaluation of Telecommunication. Networks under Traffic Self-Similarity Conditions. 5.1 Traffic Fractality Influence Estimate on Telecommunication. 5.1.2 Communication System Model and the Packet Loss Probability. Estimate for the Asymptotic Self-Similar Traffic Described by. 5.1.3 Queuing Model with Fractal Levy Motion. 5.1.4 Estimate of the Effect of Traffic Multifractality Effect on Queuing. 5.2 Estimate of Voice Traffic Self-Similarity Effects on the iP Networks. 5.2.3 Estimate of the Traffic Self-Similarity Influence on QoS. 5.2.4 TN input Parameter Optimization for Given QoS Characteristics. 5.3 Telecomminication Network Parameters Optimization Using the Tikhonov. 5.3.2 Telecommunication Network Parameter Optimization on the Basis of. the Minimization of the Discrepancy Functional of QoS Parameters. 5.3.4 TN Parameter Optimization on the Basis of Tikhonov. 5.4 Estimation of the Voice Traffic Self-Similarity Influence on QoS. 5.4.1 Pocket Delay at Transmission through the Frame Relay Network. 5.4.2 Frame Relay Router Modelling. 5.5 Bandwidth Prediction in Telecommunication Networks. 5.6 Congestion Control of Self-Similar Traffic. 5.6.2 Selecting Aggressiveness Control (SAC) Scheme. Appendix A List of Symbols. Appendix B List of Acronyms.